Basavaraj Binjawadagi obtained his degree in veterinary medicine (BVSc& AH) (2000) from the university of agricultural sciences (UAS), Dharwad, India, and MVSc in veterinary microbiology (2007) from Karnataka veterinary, animal and fisheries sciences university (KVAFSU), Bidar, India. He gained eight years of professional experience in poultry health consultancy and government veterinary/animal husbandry service. 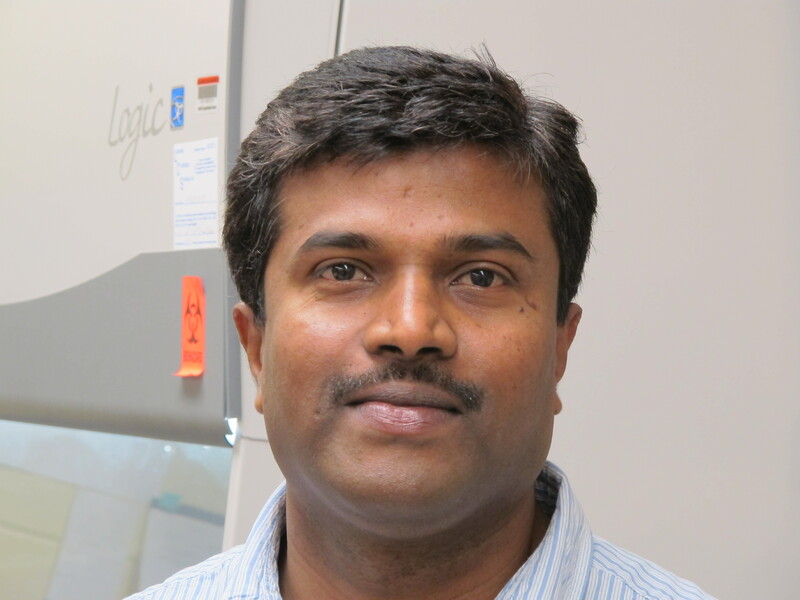 Further, he pursued MS (2012) and PhD (2015) in comparative and veterinary medicine (CVM) from the Ohio state university (OSU), Wooster, OH, under the supervision of Dr. Renukaradhya Gourapura. During his graduate studies, he worked on development of novel, biodegradable PLGA nanoparticle based mucosal inactivated vaccine and virus like particles (VLPs) based vaccine against an economically important swine viral disease, porcine reproductive and respiratory syndrome. Presently he is working as a post-doctoral researcher at the department of veterinary biosciences, OSU, Columbus, OH, under the supervision of Dr. Stefan Niewiesk, focusing on maternal immunization, and maternal antibodies interference to immunizations and novel anti-viral vaccine development with special focus on respiratory syncytial virus (RSV). 1. Binjawadagi B, Dwivedi V, Manickam C, Ouyang K, Torrelles JB, Renukaradhya GJ (2014). An innovative approach to induce cross-protective immunity against PRRSV in the lungs of pigs through adjuvanted nanotechnology based vaccination. International Journal of Nanomedicine, 9:1519-1535. 2. Binjawadagi B,Dwivedi V, Manickam C, Ouyang K, Wu Y, Lee J, Renukaradhya GJ (2014). Adjuvanted PLGA nanoparticle-entrapped inactivated PRRSVvaccine elicits cross -protective immune response in pigs. International Journal of Nanomedicine, 9: 679-94. 3. Ouyang K*, Binjawadagi B*, Kittawornrat A, Olsen C, Hiremath J,Elkalifa N, Schleappi R, Wu J, Zimmerman J and Renukaradhya GJ. 2013. Development and validation of an assay to detect PRRSV specific neutralizing antibody titers in pig oral fluid samples. Clinical and Vaccine Immunology, 20(8):1305-13 (*-equally contributed). 4. Binjawadagi B,Dwivedi, V, Manickam, C, Torrelles, JB and Renukaradhya GJ. 2011. Intranasal delivery of an adjuvanted modified live PRRSV vaccine reduces the ROS production, Viral Immunology,24 (6): 475-482. 5. Binjawadagi B, Hari Babu Y and Sreekumar E. 2009. Immunomodulatory effect of recombinant chicken interferon-gamma (rchIFN-γ) on specific and non-specific immune responses in chicken vaccinated against Newcastle disease virus (NDV). International Journal of Poultry Science,8(2):122-127. 7. Ouyang K, Hiremath J, Binjawadagi B, Shyu D, Dhakal S, Arcos J,Schleappi R, Holman L,Roof M,Torrelles JB, Renukaradhya GJ. 2016. Comparative analysis of routes of immunization of a live porcine reproductive and respiratory syndrome virus (PRRSV) vaccine in a heterologous virus challenge study. Veterinary Research(in press, VETR-D-15 -00353R2). 8. Ouyang K, Shyu D, Dhakal S, Hiremath J, Binjawadagi B, Lakshmanappa Y, Guo R, Ransburgh R, Bondra K, Gauger P, Zhang J, Specht T, Gilbertie A, Minton W, Fang Y, and Renukaradhya GJ.Basavaraj Binjawadagi 2015.Evaluation of humoral immune status in porcine epidemic diarrhea virus (PEDV) infected sows under field conditions. Veterinary Research 14:46(1): 140-150 9. Ouyang K, Woodiga SA, Dwivedi V, Buckwalter CM, Singh AK, Binjawadagi B, Hiremath J, Manickam C, Schleappi R, Khatri M, Wu J, King SJ, Renukaradhya GJ. 2014. Pretreatment of epithelial cells with live Streptococcus pneumoniae has no detectable eff ect on Influenza A virus replication in vitro.PlosONE,9 (3): e90066. 10.Annamalai T, Pina-Mimbela R, KumarA, Binjawadagi B, Renukaradhya G J, and Rajashekara G, 2013. Evaluation of nanoparticle encapsulated OMPs for the control of Campylobacter jejuni colonization in chickens. Poultry Science, 92(8):2201-11. 11.Dwivedi V, Manickam C, Binjawadagi B, Renukaradhya, GJ. 2013. PLGA nanoparticle entrapped killed PRRSV vaccine helps in viral clearance in pigs. Veterinary Microbiology, 166(1-2):47-58. 12.Olsen C, Karriker,L, Wang, C, Renukaradhya, GJ, Binjawadagi, B, Kittawornrat, A, Lizano, S, Coetzee, J, Main, R, Meiszberg, A, Panyasing, Y, Zimmerman, J. 2013. Effect of collection material on pig oral fluid testing results. The Veterinary Journal, 198(1):158-63. 13.Dwivedi V, Manickam C, Binjawadagi B, Joyappa D, and Renukaradhya GJ.2012. Biodegradable nanoparticle-entrapped vaccine induces cross-protective immune response against a virulent heterologous respiratory viral infection in pigs. PlosONE,7(12):e51794. 14.Renukaradhya GJ, Dwivedi V, Manickam C,Binjawadagi B, Benfield D. 2012.Mucosal vaccines to prevent porcine reproductive and respiratory syndrome: a new perspective. Animal Health Research Review s,2012 Jun;13 (1):21-37. 15.Dwivedi V, Manickam C,Binjawadagi B, Linhares D, Murtaugh MP, Renukaradhya GJ. 2012. Evaluation of immune responses to PRRSV in pigs during early stage of infection under farm conditions.VirologyJournal,16 (9): 45-53.